Georgetown, Guyana – (February 10, 2018) This year will mark 50 years of friendship and strong bilateral ties between the Cooperative Republic of Guyana and the Federative Republic of Brazil, which has seen cooperation in the areas of defence, health and public infrastructure programmes. With the visit of Minister of Defence, Mr. Raul Belens Jungmann Pinto and a high-level delegation on February 9, this 50-year-old relationship is set for further strengthened cooperation and collaboration. The construction of the long-awaited Linden-Lethem road is one of the key projects expected to be advanced under this agreement. In an interview at the conclusion of that meeting, President Granger said that for decades both sides envisaged a route through Guyana, which will provide better development prospects for investors to come from the Caribbean into Brazil and from Brazil into the Caribbean. “This is something that has been long discussed and in fact, in some parts of the Rupununi, roads were actually aligned but we never had funding to complete it. The infrastructure agreement we are entering will be focused on fulfilling that obligation to building a road between Lethem and Linden. Brazil has done its part; Brazil has built a bridge under President Luiz DaSilva and the road literally comes right out to the bridge. We need to do our part so that is a very important agreement that was signed,” he said. Minister of Foreign Affairs, Mr. Carl Greenidge explained that in July 2017, he and Minister of Public Infrastructure, Mr. David Patterson met with their respective counterparts to discuss moving the project forward. At that forum, it was agreed that both countries will provide financial resources for the engineering and design of the road. Minister Greenidge explained at that time that this road link is a critical piece of infrastructure that holds great potential in terms of integrating the two countries and improving trade. In terms of the second agreement, the Brazilian Army will be working closely with the Guyana Defence Force (GDF) to develop its Engineering Corps. This collaboration will see the drilling of artesian wells in Indigenous communities in villages such as Para Bara, Achiwib, Karaudarnau, Aishalton, Awarewanau, Shea and Mururanau. “As we know Rupununi is susceptible to droughts and floods so we want to remove that uncertainty and have a system under which the communities, there are over 50 villages in the Rupununi that could be supplied with fresh water continuously during the year and Brazilian terrain across the border is similar in many respects. So there is not only going to be a supply of physical infrastructure but there’s also going to be a transfer of technology,” President Granger said. During their visit to Brazil in July 2017, Minister Greenidge and Minister Patterson also turned the sod to mark the construction of a permanent building for the Guyana Embassy in Brazil. This was done in an effort to further solidify the relations between the two nations. The meeting between President Granger, Ministers of Government and members of the Defence Board with the Brazilian delegation on February 9, 2018 at State House, saw a commitment by both countries to review the September, 2012 Joint Communiqué, which followed the official visit to Guyana by Ambassador Celso Amorim, then Minister of Defence of Brazil. The review is intended to update the agreements in that document and bring them in line with present-day realities, as well as, to deepen defence cooperation. In 2012, during a visit to Guyana, Ambassador Celso Amorim the two countries reiterated their desire to intensify bilateral defence cooperation. They reviewed the existing programme of cooperation between Guyana and Brazil in the area of defence and agreed to the implementation of a number of measures aimed at expanding and strengthening collaboration not only at the bilateral but also at the regional level within the context of existing initiatives of the Union of South American Nations. In this regard, they agreed to adopt the decision to create a Guyana/Brazil Bilateral Defence Working Group (BDWG), in order to provide oversight and follow-up to the defence agenda between Guyana and Brazil, through annual meetings of Joint Chiefs-of-Staff level or their equivalent, and three sub-groups dedicated to issues relating to the Army, Navy and Air Force, to increase cooperation in the area of military training and education at Brazilian military institutions, through the provision of additional offers to military personnel from Guyana and to promote the coordination of military operations in their respective border areas, in order to ensure more effective results and to enhance the integration and stability of the respective communities. It was also agreed that the two countries will intensify collaboration in the area of defence procurement through the exchange of information and expertise, promote collaboration with civil society through the development of joint projects in the border areas aimed at the delivery of services to those communities; commence cooperation in the area of geo technology applied to defence and security, through the training of officials from Guyana the SIVAM (Brazilian Amazon Surveillance Integrated System) facility in Manaus, Brazil and send a military mission from Brazil to prepare an assessment of technical expertise that can be provided to advise and/or, work within the Guyana Defence Force to increase expertise in deficient areas. The Guyana Defence Force has benefitted significantly in a number of areas due to the friendly ties and cooperation between the two countries. Chief of Staff, Brigadier Patrick West, in an invited comment, said that the administration of the Force is pleased with the partnership between the Brazilian Government through its Military and the GDF. Numerous officers of the GDF have benefitted from training opportunities in Brazil, some spanning for a year. “We collaborate…where there are gaps, those gaps are likely to be filled with our collaborations with our bilateral partners. Brazil did some work with us and they are still doing…,” he said. In 2014, The Guyana Brazil Workgroup held its inaugural meeting where the General of Brazil’s delegation, Lieutenant Decio Luis Schons said that the Armed Forces of Brazil is looking for a sustained programme of cooperation with Guyana and possibly more far reaching levels of cooperation given the push towards South American integration. On January 19, 2018 President Granger received a courtesy call from Brazil’s Minister of Health, Dr. Ricardo Jose Magalhᾱes Barros and a delegation from that country to discuss areas in which the two states can strengthen cooperation in the health sector. The visiting Minister’s delegation included the Vice-Governor of Paranά, Ms. Maria Aparecida Borghetti and the Federal Deputy of São Paulo, Ms. Bruna Dias Furlan. During that meeting, the President also noted that while Guyana welcomes cooperation in the health sector, it looks forward to deepening cooperation in other areas such as oil and gas, infrastructure and environmental security. In July 2016, a two-day Tourism Conference was held in Boa Vista, Brazil for tour operators who are operating between Guyana and Brazil. The event was organised by Visit Rupununi (VR) in collaboration with the Department of Tourism, Roraima and Conservation International – Guyana (CI-G). Tour agencies and officials regarded the collaborative effort as a timely and significant step in developing the tourism sectors in Guyana’s Region Nine Rupununi and the Brazilian state of Roraima. 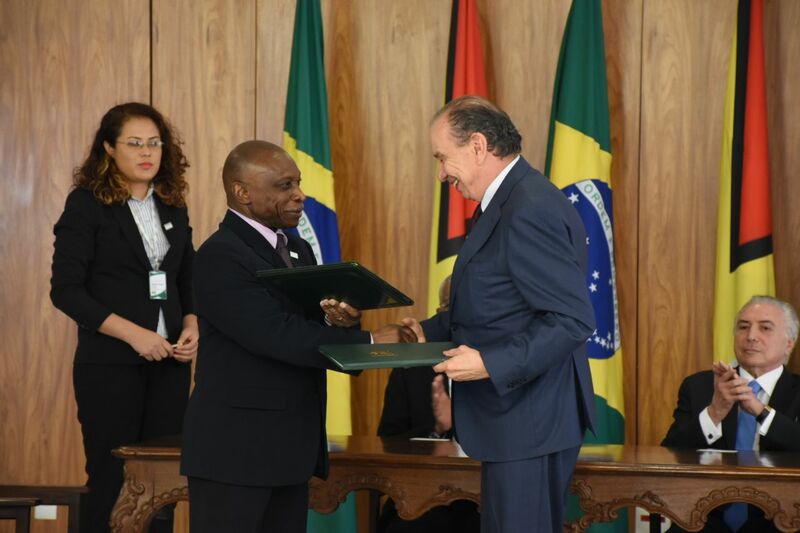 The Brazilian Petroleum Corporation (Petrobras) has expressed a keen interest in entering Guyana’s burgeoning oil and gas sector as indicated by Brazil’s President last December. President Granger explained that this is by no means a new offer, since they were engaged with Guyana in the 80s and in the early 2000s, but indicated that Guyana welcomes investments from its neighbour in that sector. “Brazil has a well-established petroleum industry, they have experience, they have expertise and Brazil is an important strategic partner, an economic partner and we extended an invitation to them, we extended an invitation to the entire world to examine the prospects of petroleum exploration and production in Guyana and Brazil certainly is one of those and will be welcomed,” he said.